Slice the fillets to about 1.5 cm thickness pieces. Heat a pan with water until boiling and put in the fish slices, as the fish is just beginning to turn completely white, turn off the heat. Carefully spoon out the cooked fish on to a dish. On a non-stick pan, fry the garlic minced with the olive oil until fragrant, add the preserved olive vegetable, kai lan and preserved radish. Stir fry on high heatfor about 1 min. Add fish sauce and mix well. Turn off heat. 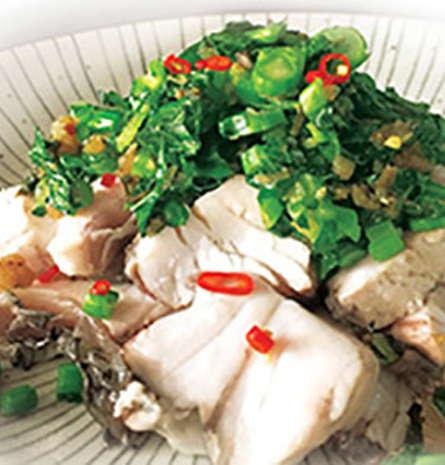 Spoon the stir fry over the poached fish slices, sprinkle chopped chilli padi if desired. Serve immediately with steamed rice. Thai chai poh (if you can find them) are best for this dish because they are sweeter and not as salty as the local ones. If using local chai poh, you may want to soak the cai poh in water and drain off after one minute before using to remove excessive salt. The fish will continue to poach in the water after you turn off the heat so it is alright to turn off the heat once it is beginning to turn white on both sides. 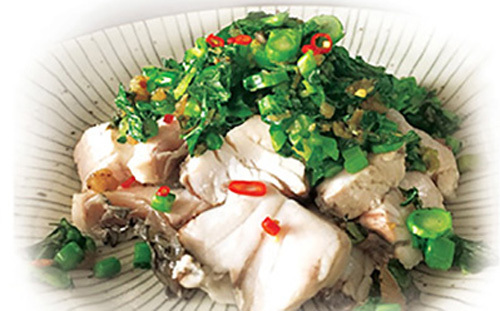 Over-cooked fish will not be as tasty.You may wish to stir fry the fish instead of poaching.